Shortly after lying down in my hammock, a hard rain began to fall. I quickly rolled out of my hammock and threw my belongings sloppily into one of the tents that had room for an additional guy. Everyone scrambled to put the rain flies on the tents because we had chosen to sleep without them during the trip due to in the Costa Rican heat. Around 5:00 AM came the almost daily interruption of our morning. This time, however, it was not a rooster, goose, or other fowl, but rather a new bird with a far more annoying call than any had previously made. It literally made the Dolby Surround Sound warm-up noise repeatedly for the entire morning. We were not amused. Upon leaving our tents in the morning, we were greeted with a wonderful surprise. In the night, one of the turtle nests had hatched in the sanctuary and we were going to release them before breakfast. A full bucket of baby sea turtles (they were carefully places in their by a man with a glove on) was brought to the beach and the turtles were poured out in a line on the sand. Some had not yet woken up from their slumber and were put back in the bucket so they could be released later that day when they become conscious. The rest began their long journey down the beach with us protecting them from the birds. We had to release the turtles high on the beach because their journey across the beach is crucial for them to be able to return to this specific beach in order to lay eggs in successive years (The turtles have glands that learn the exact sand composition of the beach and the turtle will return to the same beach for the entirety of their life). When all of the baby turtles had made their struggle into the vast waters of the Pacific Ocean, I took a walk down the beach. I was amazed at the variety of shells and lack of trash on the beach. It was so clean and natural looking. Eventually, I wandered back to our camp for breakfast. The waves were not yet sufficient for surfing, so everyone helped do community service around the grounds where we stayed. Some helped with the turtle hatchery while others removed debris from the ground. Coconuts were thrown into the jungle and fallen branches stacked at the edge of the jungle. When the waves had built enough for surfing, everyone went to the storage room and grabbed boards. Since I had previous experience surfing and have done nearly every board-sport imaginable, I was permitted to forego the padded noob boards and take a hard board. The instructor was really cool about this and took time to teach me how to properly wax a surf board and what to look for should I ever be in the market to purchase one. After waxing my board, I joined the others in the surf and began catching waves. I found the board to be a lot of fun and began practicing my turns. It was challenging, but I was successful in making a few turns and was happy with the speed at which I was picking up the sport. I don’t know what it is with myself and water sports, but we just work well together. Consumed by hunger, we took a break from the waves and went in for lunch. We had fresh pineapple, watermelon, cantaloupe, coconut, and sandwiches. It was healthy, filling, and delectable. Everyone left the meal with full stomachs and bodies tired from surfing (which is a lot more work that it appears to be!). I went and laid in my hammock while the rest of the group grabbed their sleeping mats and lay in the shade around me. It was siesta time as the afternoon sun turned the sand too hot to stand. Several members of the group talked and laughed quite loudly, so none slept, but it sure was nice to rest in such a warm beautiful place. It was 88 degrees in the shade with a light breeze. Life could not be better. 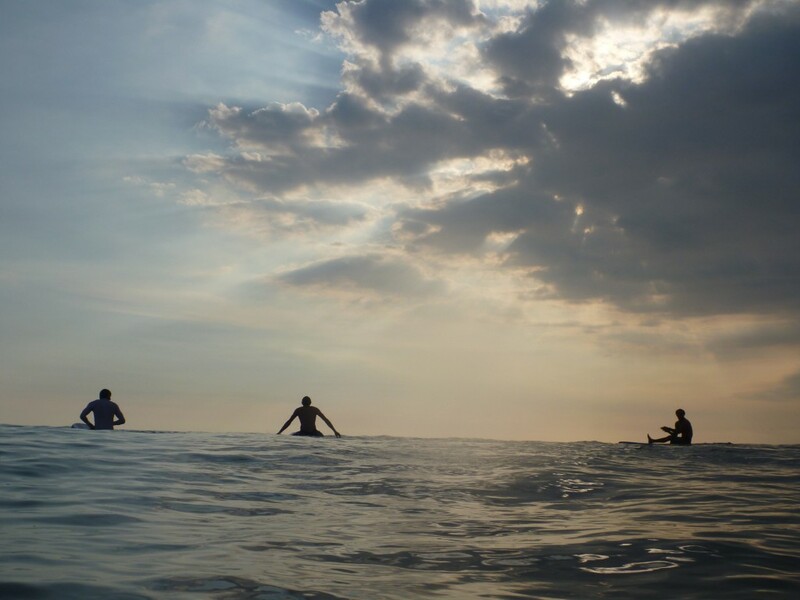 Eventually, the group grabbed their boards, I grabbed mine, and together we headed down to the water. We surfed non-stop for hours. As the gigantic sun began to drown into the aquatic horizon, it painted the canvas of the sky a luminescent watercolor of every pink and purple hue imaginable. Having paddled myself beyond the breakers, I laid half-submerged with my back atop my surfboard in order to watch as the glowing bauble in the sky sank below the horizon. I had never seen the sun so large. 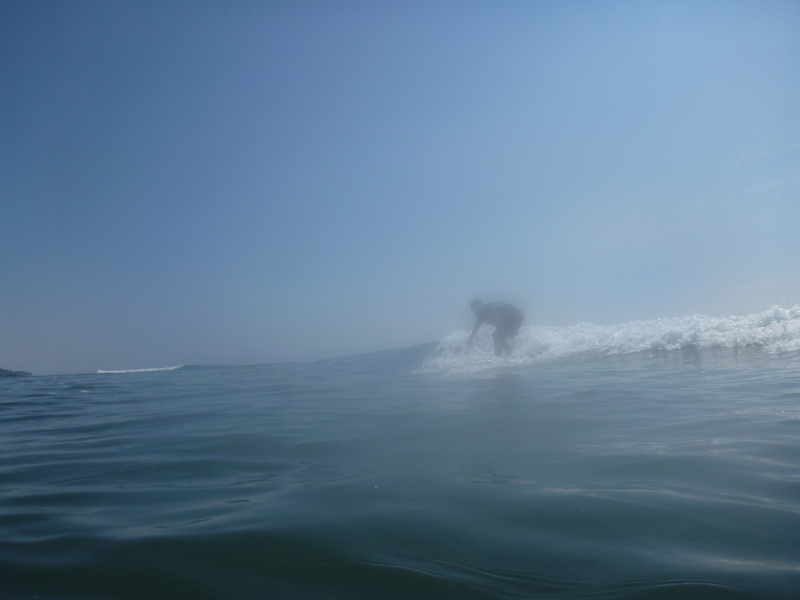 Viewing it from a surfboard that was gently bobbing in the warm, Pacific Ocean water made it an unbeatable experience. I found myself having one of the few moments of my life that stand above the rest. Life was pure – Pura Vida. Upon returning to the beach, we were informed that the other group from our college would be arriving soon. We were all a little nervous as our group had formed a very tranquil atmosphere and the other group was much louder and outspoken. Their arrival, with shouts and song that could be heard from far down the road only made us more nervous. Fortunately their energy did not stay too high for very long and the two groups quickly blended together as they had in the first day of the trip. Later that evening, everyone was asked to sign up for a one-hour shift watching and protecting the turtle nests during the night. I signed up with a girl whom I had been friends with for a long time but rarely spoke to outside the trip. We got along very well and had many things in common. It was fun to sit and catch up on the last few years where we had been near to one another, but so few words were exchanged. While everyone got ready to go to bed, our surf instructor broke out his guitar and began to serenade the camp in his Costa Rican accent. He was a well built man with dark complexion and gnarly dreads. The girls all melted when he played “Banana Pancakes” by Jack Johnson, but I rather preferred his renditions of “Jammin” by Bob Marley and “The General” by Dispatch. I quickly fell asleep because I had essentially been up since 5:00 AM thanks to the Dolby-Surround-Sound-bird and had signed up for a turtle-watch shift in the middle of the night. My hammock was comfortable and I was happy to be in it again (if only for a while). This was amazing and brought back so many memories of my trip to Costa Rica. It was then, when I fell in love with turtles. helping them find the was to the water, was yet another experience for anyone’s bucket list. Seeing newly hatched sea turtles is at the top of my bucket list! I love your pictures. I can’t wait to see them in person.